The core of this heavyweight, bluesy band comes from Joe Caro, who is surely at the height of his wild and wailing guitar and high and lonesome vocals, who is elevated by the rock steady rhythmic foundation by drummer Anton Fig, bassist Billy Paterson and keyboardist Chris Palmaro. On the rollicking music of Every Dog Has His Day, this Met Band (as the ensemble is called) finds an eclectic jazzy mix of trumpet (Michael Rodriguez), saxophone (Aaron Heick) and trombone (Tom ‘Bones’ Malone). This potent collision results in an album of songs with a rippling momentum propelled into the stratosphere by a tumbling percussive groove. 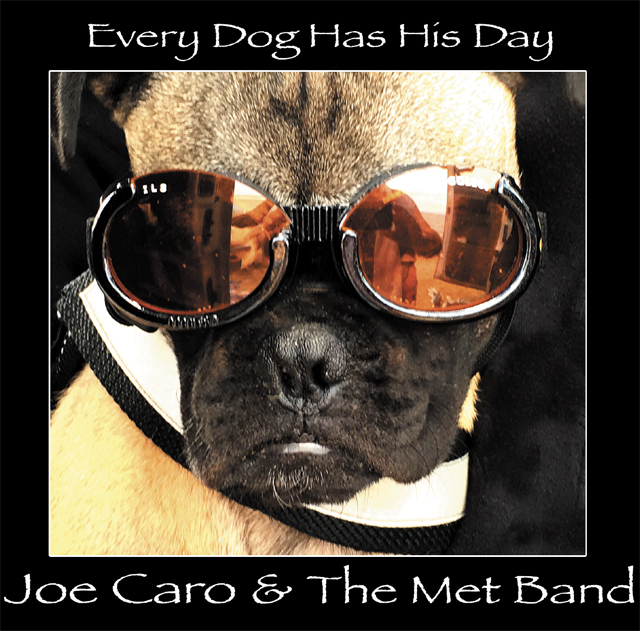 While the voice and guitar Joe Caro launches the songs into orbit, the loose, funky rhythms are sustained by the keyboards, bass and drums and the huge heft of the brass and woodwinds. Meanwhile on Mr Caro’s covers of Bob Dylan’s (“Highway 61 (Revisited)”) Jimi Hendrix (“Fire”), The Met Band, shorn of all its accoutrements, is left with just guitar, keyboards bass and drums and this makes for some of the high points of the album. Meanwhile on Harold Arlen and Johnny Mercer’s “That Old Black Magic” the smoky horns provide a magical backdrop for the appropriately wailing vocal of Joe Caro. Also turning in superlative performances are Aaron Comess (drums), Mark Egan (bass), Chris Parker (drums), the ubiquitous Bashiri Johnson (percussion), Etienne Stadwijk (piano), Paul Schaffer and Ricky Paterson (organ) and Robbie Kondor (keyboards). But make no mistake this toe-tapping groove is all the work of Joe Caro, who has also done the bulk of the writing for this album. His music shows a wonderful grasp of the Blues (“Every Dog Has His Day” and “Big Mouth”). Mr Caro also has a wonderful sense dark sense of the dramatic, which is superbly enacted on “Big Mouth”. And while Mr. Caro is a versatile writer, his songs do not stray very far from their bluesy connotations and inflections. Still he is capable of writing the affecting ballad “Never Be Lonely Anymore” as well as re-imagining classic Tim Pan Alley songs such as Carole King, Gerry Goffin and Jerry Wexler “Natural Woman” in a wonderful new instrumental vein that distills the essence of the song into some glorious instrumental playing on this iconic piece. This is a truly memorable album, viscerally exciting and wholly illustrative of Joe Caro’s wonderful skills not only as a vocalist but especially as writer and guitarist, something clearly in evidence on the wolf-like howl of the instrumental “When We Were Young”.